Imagine a team of scientists collecting DNA samples to see if the seafood sold at local restaurants and stores is correctly labeled. They go to sushi shops, grocery stores and other retail venues and carefully place tiny samples of the fish in a small vial containing ethanol. 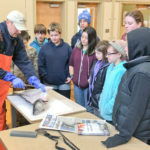 Then they take it to the lab where they will use genetic techniques, including Chelex extractions and polymerase chain reaction (PCR), to analyze the DNA of the sample to see if the snapper they purchased is actually Pacific rockfish. Their work is crucial. It will provide a deeper understanding of the rate at which seafood is mislabeled in area retail stores. Now imagine these scientists are in high school. I was inspired by the senior biotech class I visited March 18 at Harbor High School in Santa Cruz, California. I was even more inspired by teacher Nehal Pfeiffer, who developed this project to combine classroom/lab study with real-world challenges. 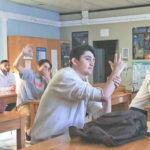 To get students thinking about how the process would work, she started students on testing different foods for genetically modified organisms (GMO). The students were somewhat surprised to see high GMO content in Cheetos (corn) and veggie burgers (soy). Then the teacher had them break out into groups representing different players in the food industry such as farmers and Monsanto and try to get at the heart of the discussion. You can guess how this ends up. Lively discussion. Engaged questions. Thoughtful conclusions. So I was honored to be invited to speak to these students about fraud in the seafood supply chain. I was there to give them a broader perspective of how and why it happens, the larger dynamic of US and global seafood consumption and what we can do about it. Great question that prompted an excellent, interactive discussion. The truth is that current management policy, combined with a clunky mishmash of federal oversight spread over four disparate agencies with a confusing web of priorities and powers enables these types of fraud. 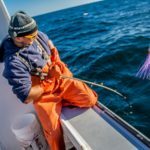 Rafael, the self-styled Codfather, was enabled by the catch share system in the New England groundfish fishery to amass a giant horde of access (permits) to essentially “own” the right to catch more groundfish than anyone else in and around the Gulf of Maine. He then used that power to force out many small-scale fishermen while vertically integrating so that his team of captains could work with his on-shore processing facilities to mask the cod and Dover sole he was catching as abundant (and less subject to expensive quota limits) haddock. He then sold this fish to New York restaurants for bags of cash. Fortunately, he got caught bragging about the scheme to undercover IRS agents posing as Russian mafia. I then explained the Sea to Table story as one of co-optation of values. 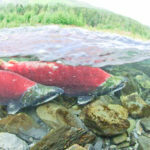 One of the early pioneers of the national boat-to-plate sustainable seafood movement, Sea to Table was outed in an in-depth Associated Press exposé last summer, in which the Brooklyn-based company was alleged to have claimed some of its tuna had been locally harvested off Montauk, NY, when in fact it was caught in North Carolina. Other allegations include selling domestic seafood that may have been linked to international slave trade and offering wild harvested sea urchin that was actually farmed. My goal was to give Harbor High students an understanding of why this matters. Beyond the science, which is super cool and something I lament not having access to way back in my time, the understanding of how and why this type of fraud matters hopefully inspires these students to dig in. I’d love to see them discover the level of mislabeling in their communities, put that in context, and do something about it. I hope they spread the message about why knowing where their (our) seafood comes from matters. I hope they ask questions and share the 7 C’s of Sustainable Seafood with family and friends. And I really hope they get involved in marine science, biotech, climate science or any related field. Seafood fraud is a significant problem and erodes the trust necessary to make community-based fisheries markets work. And it is just one very complex problem in the domestic and global seafood supply chain. 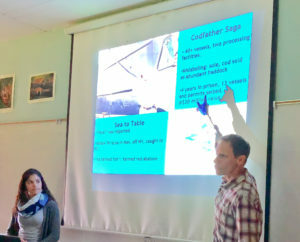 So I would like to thank Nehal Pfeiffer at Harbor High, and University of California Santa Cruz graduate students Stephanie Webb, Arina Favilla and May Roberts, all of whom coordinated this year’s seafood project with Nehal, for inviting me to speak with the students. My discussion with these thoughtful, determined students inspired me, giving me hope that we can address these complex issues together.